This classic safari explores some of the most outstanding of Botswana’s natural wonders, including a mobile safari experience in the Okavango Delta – a chance to get a direct and authentic taste of this wetland paradise. If you’re serious about seeing wildlife, in quantity and close up, then few destinations rival the Okavango Delta with its intricate web of floodplains, islets and waterways that teem with game and birdlife. 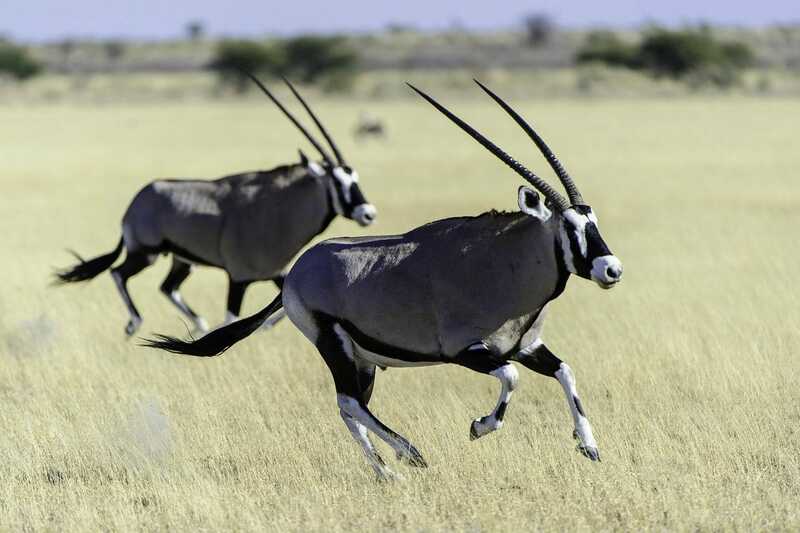 After a few nights discovering the region you’ll fly to the Kalahari Desert to discover a totally different environment made up of salt pans, sweeping valleys and scorched plains. You’ll explore private reserves where wildlife roam in vast numbers and vehicles are scarce. Led by expert and passionate guides, you’ll experience these pristine wilderness areas in a variety of ways – on foot, by canoe, in 4x4s and even on horseback. Accommodations throughout is in comfortable, traditional-style safari camps complete with modern amenities and wonderful views. Flights, park fees and full board at Letaka Safaris, Stanley’s Camp and Dinaka. Based on two people travelling. Your overnight flight from London lands in Johannesburg. You’ll board a connecting flight to Maun, and then hop on a light aircraft to your camp in the Okavango Delta. Your private mobile camp is located in the game rich area of Khwai, just north of the Moremi Game Reserve. Enjoy the exclusivity that comes with staying in a private concession – which means off-road driving and a rich variety of wildlife. Wild dog, lion, leopard and hyena are all present in good numbers, in addition to plenty of plains game. As well as game drives, you’ll enjoy exploring the delta’s waterways in a traditional dugout canoe known as a ‘mokoro’. Today you board another light aircraft to your next destination, Stanley’s Camp, which sits within a 260,000-acre private concession on the southern tip of Chief’s Island. Game viewing in the area is superb, with healthy populations of both predator and plains game. Activities feature game drives in specially designed vehicles as well as walking safaris and excursions by mokoro canoe – a great way to encounter the reserve’s crocodiles, hippos and fish eagles. Scenic helicopter flights, on the other hand, will allow you to fully appreciate the enormity of the delta. During your stay you’ll have the opportunity to take part in the camp’s ‘Elephant Interaction Activity’, a chance to walk unobtrusively alongside two rescued elephants as they forage and wander through their natural environment. Your next stop is an exclusive private reserve on the northern edge of the Central Kalahari Game Reserve – a seemingly desolate region filled with unique and hardy wildlife. The landscape is covered in striking red sand and interspersed with ancient salt pans, bushes and forgotten fossils. It’s particularly spectacular during the summer months when the rains bring the desert to life and a wide variety of wildlife converge here. Day and night game drives offer you encounters with wonderful species like the Kalahari lion, honey badger, wild meerkat, Oryx and brown hyena. The birdlife is also prolific with over 200 different bird species – including the crimson-breasted shrike and pale chanting goshawk – to tick off your list. Don’t miss out on walks with San Bushmen who’ll provide a unique insight into their culture and traditional way of living. Today a light aircraft flight will take you back to Maun for your flight to Johannesburg, where you’ll connect with an onward flight to London Heathrow.